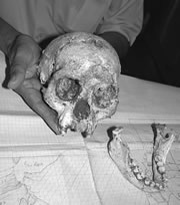 In 2004 on Indonesian island Flores an outstanding finding has been made. Remains of six humanlike creatures, which were about one meter high, have been unearthed from 6 meters depth. In publications, which excited the scientific world, photos of well kept cranium of the walking upright specimen Homo floresiensis LB1 were presented. It was determined as female and having age about 30 years. The geological age of the finding is between 12 and 18 thousand years. Stone instruments, traces of fire, and remains of animals used for food were found in the same layer [1,2]. This discovery can make positive affect on researches of relic hominoids, creatures that live nowadays and are neither people, nor known primates-anthropoids. Their existence does not acknowledge by prevailing scientific concepts till now. As is known to the interested in hominoid problem, their contemporary living with us on the Earth is proved by various modern sources. Certainly, hominoids were noticed by people, that lived in past times. This knowledge is found in old books, legends, in native folklore, and it gives important data for understanding to many features of these creatures. It is reasonable to assume, that the information about hominoids in prehistoric times may be among fossil materials of paleoanthropologists. Links between fossil and living hominoids are not investigated practically at all. It is possible as one of the first examples to point at comparison of small Himalayan yeti cranium reconstruction with a fossil cranium of Homo erectus from China . Such negative situation is supported by a paradigm prevailing among scientific community that encourages research of earlier ancestors of humans. Findings with doubtful human attributes in 2, 4 and even 6 million years fossils cause agitation in scientific magazines and mass press while materials with dating close to our time remain unnoticed. The skeletons of the creatures unearthed by Australian and Indonesian scientists from grotto Liang Bua on Flores became the first recognized proof for coexistence of various Homo species at times so close to us. Figs 1 shows reconstruction of one of the skulls, LB1, and its comparison with a human cranium. Its size slightly exceeds diameter of a large grapefruit, and the volume of a brain is 380 cubic cm, alike chimpanzee’s. Unfortunately, the photos in publications show the cranium only in front view. It accents on human features of the cranium and conceals its anthropoid ones (development of brow arches, prognathism and absence of chin). On Figs 2 it is visible, that these features of on cranium LB1 are rather appreciable, as well as sloppy forehead. Therefore, there are some base to consider, whether this find can have common with hominoids, living, according to a number of observations, on Indonesian islands. Figs 2. The cranium and mandible of Homo faresiensis have some anthropoid features. After this discovery it became widely known, that local residents of island Flores know for long time about existence there of small strange peoples. They name them Ebu Gogo. Their growth about one meter, they are covered with hair (sic!). They also make sounds like “murmuring” one to the other that the locals do not understand. Probably, it is their language or means of emotion expressions. Ebu Gogo are able to imitate sounds and words of human speech. Their behavior and capacities are similar to that of hominoids from other areas. On islands of Indonesia and, probably, in Malaysia lives another kind of undersized bipedal hominoid ¾ orang-pendek. They are from 80 up to 120 cm high and covered by hair. Observers say about black and dark-gray color of the hair with silvery streaks. Its straightened figure is similar to human’s. Their arms are relatively longer that human has, on their faces brow arches and nose of human form are seen. Their traces show that orang-pendeks have feet with a big toe pointed aside. In spite of such sizes they considerably surpass in force local residents. Research of Homo faresiensis skeleton is not completed yet, and there is no ground for more sound assumptions. But among anthropologists and other scientists the opportunity that these creatures could overcome last to us time interval of 12 thousand years is discussed. This is significant change of view of the person who is an advanced scientist and who also, as the editor of the basic edition, defines many of what will be read in scientific community. In February 2002 in reply to my offer to publish photos of Himalayan yeti Henry Gee wrote: "Thank you for submitting your manuscript, which we regret we are unable to publish. It is Nature's policy to decline a substantial proportion of manuscripts without sending them to referees. <…> In this case, we feel that the evidence presented so far is insufficient to substantiate the claim for a new species of large primate in the Himalayas." Articles with the yeti photos had been published elsewhere  and exposed in the Internet so now reader himself can judge, whether they were interesting. There is a hope, that new views will help to publish other paleoanthropological data that were considered earlier as not valid. 1. Brown P., et al. Nature, 431. 1055 - 1061 (2004). 2. Morwood M. J., et al. Nature, 431. 1087 - 1091 (2004).